When he was eleven years old, George Washington inherited ten human beings. His own life has been well chronicled, but the lives of the people he owned--the people who supported his plantation and were buried in unmarked graves there--have not. 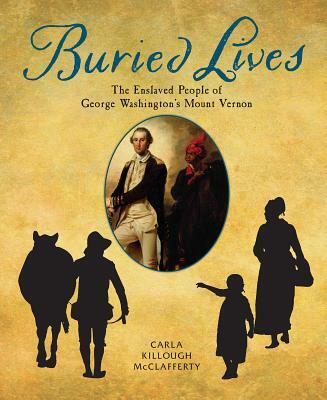 Using fascinating primary source material and photographs of historical artifacts, Carla McClafferty sheds light on the lives of several people George Washington owned; the property laws of the day that complicated his decision to free them; and the Cemetery Survey, an archeological dig (set to conclude in 2018) that is shaping our understanding of Mount Vernon's Slave Cemetery. Poignant and thought-provoking, Buried Lives blends the past with the present in a forward-looking account of a haunting piece of American history. Includes a foreword by Zsun-nee Matema, a descendant one of the enslaved people at Mount Vernon who is highlighted in this book, backmatter outlining the author's sources, and an index. Carla Killough McClafferty is the author of many nonfiction books for young readers, including The Many Faces of George Washington: Remaking a Presidential Icon, which was a School Library Journal Best Book of 2011, a Junior Library Guild selection, and an ALA Notable Book.